This is among the most popular tennis events in the world yet not many people know how big it actually is. There are times when members of the royal family attend the matches too. Even the Queen has attended matches in the past. They have a Royal Box of their own. Wimbledon is among the four major tennis tournaments that take place every year. But, it’s the only big tournament which is played on grass. The courts are all outdoor except the centre court which has a roll-away roof making sure the game can continue even if it’s raining. Wimbledon has a strict dress code for the players which are a tradition. In most tournaments, you will see clothing with branding and funky designs but not here. Here, players have to stick to white shirts and dresses though they’re now allowed to add green to their attire. The tournament has been held since 1868 and the main courts are not used for anything else throughout the year. The lawns are taken care of throughout the year though to get ready for this event. 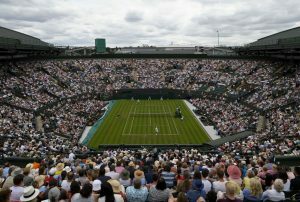 There are 5 main events which take place at Wimbledon each year, the men’s and women’s singles, men’s and women’s doubles and mixed doubles. The number of players taking part each year are 128. There are 32 combined seeding awards for men and ladies. Every tennis player hopes they can get seeded at this event at least once in their lives. Prize money only became a part of Wimbledon in 1969. Before that winners only got a large trophy. Nowadays they also win a few million Pound Sterling. Even if you just like watching tennis, attending the final of the Wimbledon is something you absolutely must do at least once in your life. You will remember it forever.